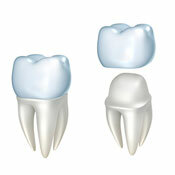 A dental crown is a cover or ‘cap’ that encases the whole tooth, becoming the tooth’s new outside layer. Crowns are typically made of porcelain, or a combination of porcelain and other restorative dental materials. They are placed on the teeth with dental cement. Crowns are an option for restoring chipped, decayed, discoloured, broken, or misaligned teeth. Their main purpose is to restore the tooth’s full function. Crowns can be used to restore single teeth or multiple teeth, and can be used to anchor a bridge or cover dental implants. With the technology in our Paddington dental office, same day crowns can now be created on-site, often in under two hours. Depending on the health of the underlying tooth, crowns can last for many years. Ask Dr Henry if a crown is the right solution for your particular dental issues. 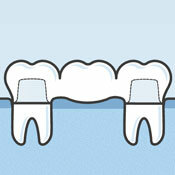 Dental bridges are an alternative to dentures for the replacement of one or more missing teeth. A number of dental issues can arise from missing teeth, including the shifting of remaining teeth, problems with the joints of the jaw, and even speech impediments. A bridge spans the space where the teeth are missing. It is made up of crowns for the teeth on either side of the gap – these teeth become the ‘anchors’ – with a false tooth (or teeth) in-between. The process of fitting a bridge generally requires two visits. A temporary bridge will be placed to protect your teeth during the first visit, and a permanent bridge (constructed by our dental laboratory) will be securely placed during your second visit. Dr Henry will consult with you to develop a treatment plan for your missing teeth that will work best for your specific circumstances. Ready for Your Best Smile? If you would like to experience the Red Hill Dental difference for yourself, please schedule an appointment with our friendly practice today.